Example light curves of heartbeat stars found in the Kepler data. The light curves look somewhat similar to an echocardiogram, which prompted the name. As you can see, heartbeat star light curves somewhat resemble an echocardiogram, which is what got them their name. But what is physically causing this odd pattern? In a traditional eclipsing binary star system, we see a dip in the light curve when one star passes in front of the other. Heartbeat stars, on the other hand, do not always eclipse. Instead, they have extremely elliptical orbits, which causes the two stars to spend a short amount of time very close together as they race past each other and a long amount of time farther apart. The main dip and subsequent peak of the “heartbeat” signature occurs when the stars are closest together and tidal forces are incredibly strong. When tidal forces affect a star, they distort its shape and cause brightness variations. If you visualize two perfectly spherical stars orbiting each other, the out-of-eclipse luminosity should be constant. But if the two stars slightly distort each another with tidal forces, they become somewhat squished and more like ellipsoids than spheres. As a result, you see more star surface area during one part of the orbit than another, and that causes a slight increase in overall brightness. Now, imagine dialing this effect up by drastically increasing the orbital eccentricity. Instead of happily orbiting in circles with constant velocity, the two stars spend most of their time far apart, and a few harrowing hours racing past each other. Or, to put it another way: hours and hours of boredom punctuated by moments of sheer terror. This is a heartbeat star. Tidally distorted light curves were first theorized in 1995, but the first well-studied example was published in 2011 using Kepler light curves. 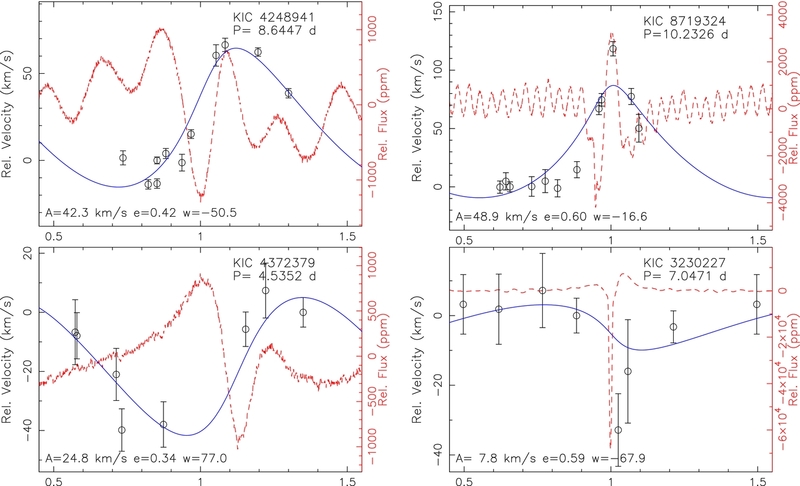 This paper presents 17 new systems on top of four that were previously known, and successfully models how the tidal distortions contribute to light curves. They also measure radial velocity points for some systems and show that these are generally consistent with the orbital solution. Observed light curves (red) and model radial velocity curves (blue) for four heartbeat stars. The black points are observed radial velocities. The x-axis is Orbital Phase, which means that both curves are “folded” on the orbital period of each system. (Phase = 0.5 is the same physical orientation as Phase = 1.5.) The blue radial velocity model is not fit to the black points; rather, it is calculated from a model fit to the light curve and shown to be generally consistent with observations. The discovery of so many heartbeat stars raises an important question: how can they exist at all? Over time, the orbits of relatively short-period systems (it only takes these stars several days to fully orbit each other!) should become less eccentric and more circular. But if this always happened, we wouldn’t see any “heartbeats” at all. One possible explanation could be the presence of a so-called third body—a faint star or planet that perturbs the orbit and keeps it eccentric. But this is not fully understood. A smaller effect seen in many heartbeat star light curves is pulsations. These are the little wiggles in the red light curves above—one or both stars are pulsing in and out, or “breathing,” as they orbit (see a similar situation explored in this astrobite). 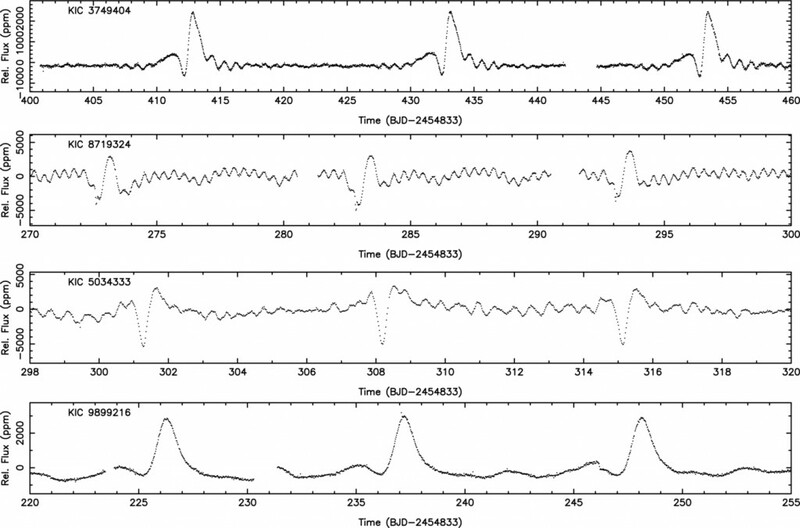 The authors find that the majority of the heartbeat star pulsations are some harmonic of the orbital period. This suggests that tidal distortions may be causing the pulsations, and is a very interesting topic for follow-up studies.